Well, that wasn’t very pleasant, was it? At the beginning of June the price of gold touched just shy of $1,420, and on the last day of spring, June 20, gold almost touched $1,275, for a drop of over 10% in less than a month. Ouch. We are now two and a half years removed from the all time high of over $1,900 in the summer of 2011, and the closing price on Thursday of $1,277.80 is approximately the price gold was at in mid-September, 2010. You may therefore conclude that the last three years were the “lost years” for gold, with the price of gold remaining unchanged for three years. 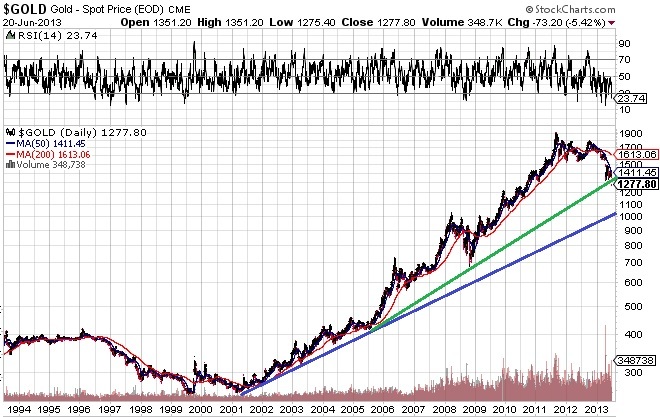 A scan of the gold price over the last 15 years shows that the long term uptrend remains in place (drawn from the lows in 2001 through 2006), and that trend will remain in place even if gold drops into the $1,000 range. The steeper uptrend line (drawn in green on the chart above) from the 2006 through the 2008 lows is now broken, so a fall into the $1,000 to $1,100 range is quite possible. So is now the time to panic? No, obviously the time to sell was two and a half years ago. In hindsight, the correct answer was to sell all of your gold and put all of your money into paper, like DOW stocks, and ride the wave. The problem with “selling at the top” is that you must then “buy back in at the bottom”, which is difficult to do, because you don’t know where the bottom is, when you are living through the carnage. To help with this exercise, I’ve created a chart showing the period from July 2007 to June 2012. (Click the chart on the left to enlarge). In July 2007 gold was under $700 per ounce, and then went on a great run, peaking at over $1,000 in April, 2008. 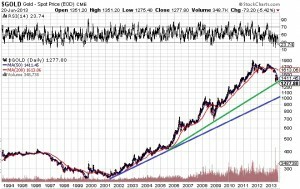 Gold was over-bought and started to slide, and when the crash hit in the Fall of 2008 gold was back to $700. Sound familiar? Over a year, with big gains, and then big losses, netting out to nothing. Remember how depressed we all were in 2008 when gold crashed? Remember how we all sold our stocks, and our gold, at the bottom? From there, of course, gold went from $700 to $1,900, a gain of 170%. All was good. And here we are again. The time frames are longer, but the pattern is the same. Instead of a one year correction and collapse, we are in a two and a half year correction and collapse, but the result is the same. We are back where we were three years ago. They go up to high, then they crash down too low. Lather, rinse, repeat. The Bernank said that maybe, perhaps, someday, he might stop printing money, and the market crashed. When markets crash, as we learned in 2008, everything goes down. If I get a margin call, I sell whatever I can to raise cash. When the tide goes out, all boats go with it. But as inevitably night follows day, day also follows night. 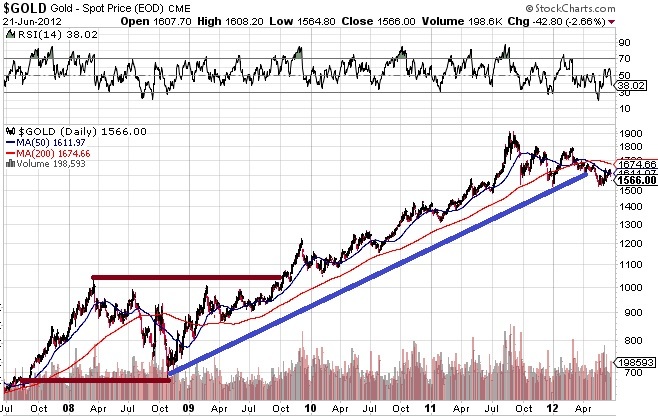 Gold will bounce back, probably with even greater vigour than before. 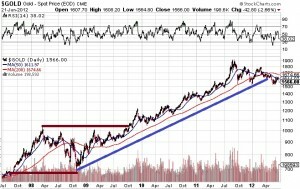 We all know that JP Morgan is a big player in the paper gold market, and we know that they have a large short position. If you have a short position, what do you want? You want gold to go down. It has. You can now cover those shorts, and make a pile of money. Even better, if you sold short gold that you didn’t own, and are at risk of getting delivery notices for gold you don’t have, it’s very convenient that gold has crashed so you can now buy it back at cheaper prices, to honor your delivery commitments, isn’t it? If I was manipulating the paper gold market I would goose it down one more time, perhaps to the capitulation level of $1,000 per ounce. I would then cover all of my shorts, and I would go long, big time. You know, just like happened in 2008. Folks, the truth is this: the economy is still broken. Real unemployment is high, and debt levels are very high. Debt must be repaid, and eventually that is inflationary. Perhaps not today, or this year, but it will be inevitably. I will hold my gold stocks (provided they have adequate cash and resources to weather the storm). On days of strength, I will write short term out of the money calls to earn the premium. With the crash of gold in June all of the calls I sold expired worthless, which helped me mitigate some of my losses. I will continue to build cash. If we see $1,000 per ounce, or even $1,100, it may be the buying opportunity of the decade, like 2008. I want to have the cash to be ready. Beyond that, I will enjoy the summer.